Dinners at our house are a source of great contemplation. I generally start the day wondering what to cook for dinner. On week nights it needs to be something simple and quick; generally something prepared within 30 minutes after we get back from yoga. These days I tend to plan ahead so that I have everything on hand. Weekends provide greater opportunity for indulgence – both in terms of produce and preparation. We try and steer clear of too many carbs and fatty rich foods and eat clean – lots of fresh salads and vegetables. On Friday I made a seared kingfish salad with a roast shallot and chilli dressing. 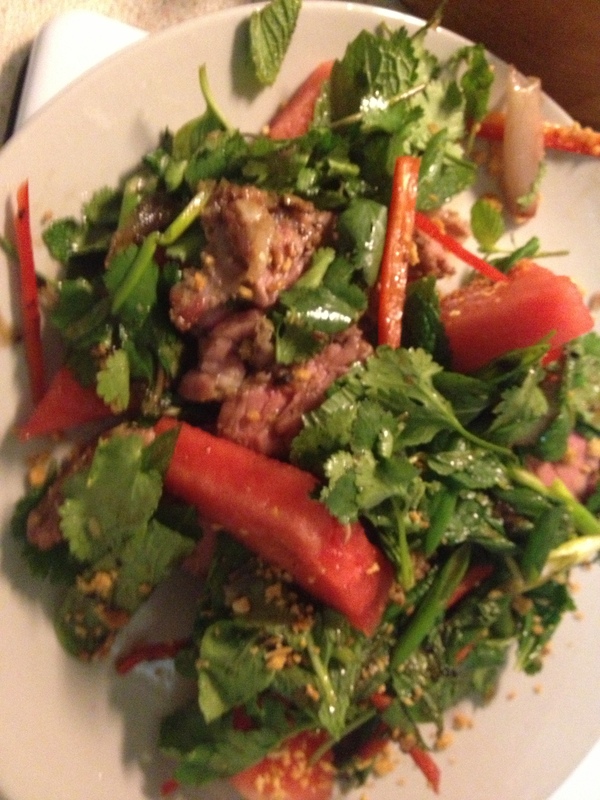 The salad has thin triangles of watermelon, coriander, mint, spring onion and julienned chilli. Fresh and delicious. I had enough dressing left over to use in another meal so adapted this receipe for seared beef. You need to marinate the beef (I used a small eye fillet) – preferrably for 2 hours but I only decided what to do an hour before hand and it was still extremely flavoursome. Marinade: finely chop 1 lemongrass, 2 red shallots, 2 garlic cloves and pound to a paste in a mortar and pestle with 2 tablespoons fish sauce. Rub this over the beef and then cover and refrigerate. Preheat oven to 180c. Place shallots in a roasting pan and roast until very tender (15-20mins). Cool and peel. Meanwhile, heat oil in a frying pan on medium-high heat and add chillies turning occaisionaly until crisp (1-2 mins). Drain on absorbent paper and cool. Pound chilli, sugar and 1/2 tspn salt to a fine powder in a mortar nad pestle. Add half the shallots (reserve the remainder for salad). Pound to a fine paste then add lime juice. 60g watermelon cut into thin triangles. Mix coriander, mint, spring onion and chilli in a bowl. Dress at the last moment or the salad will get very soggy. Sear the beef (cook to your liking – I like mine rare), rest and cut into thin slices. To plate: place watermelon triangles and beef on plate then add dressed salad and top and sprinkle with fried garlic (available from Asian grocery). This dish is so versatile you can use any nice firm fleshed fish – tuna would be good – or pork or duck. Allows for limitless variations.